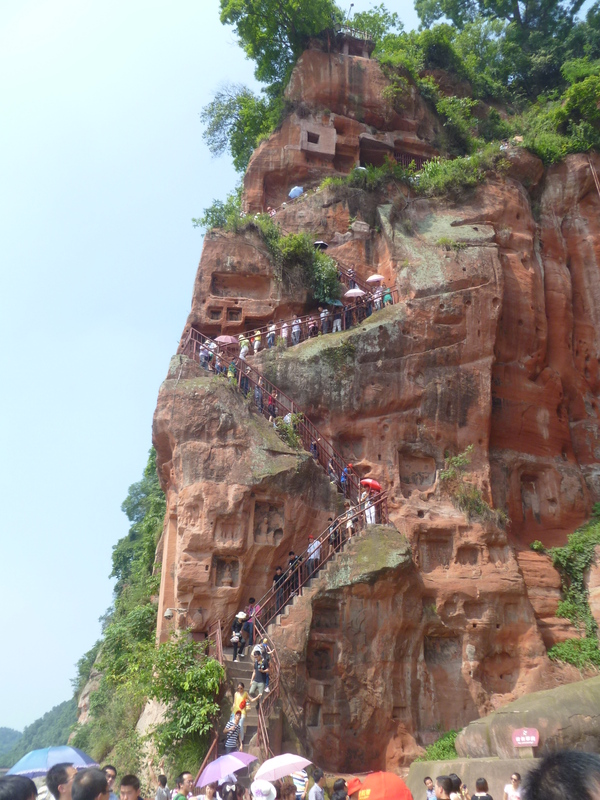 One of the things that I really wanted to see in Sichuan before I left China was the Leshan Dafo. Given that I only have a short time left in China, it was about time that I went. 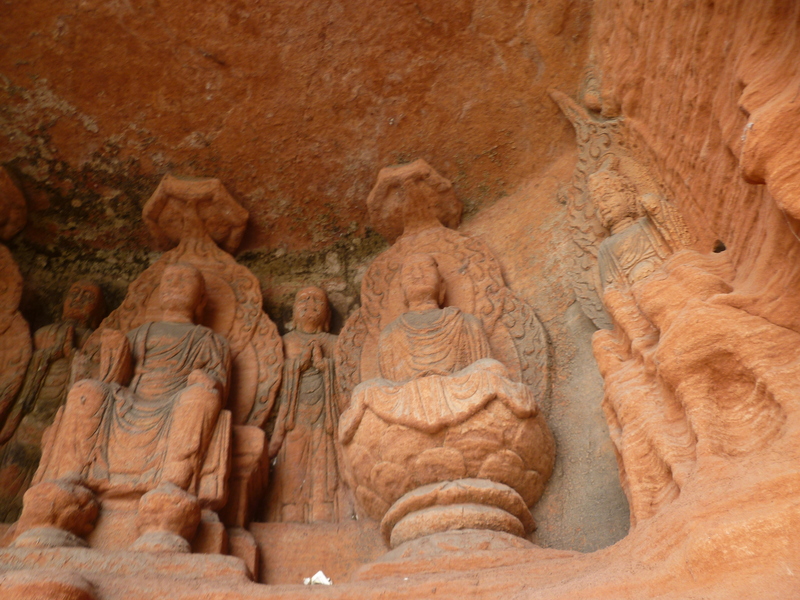 Leshan is about two hours by bus from Chengdu, making it an excellent day trip. Kate and I decided to go on Saturday, fairly last minute, on Friday night. 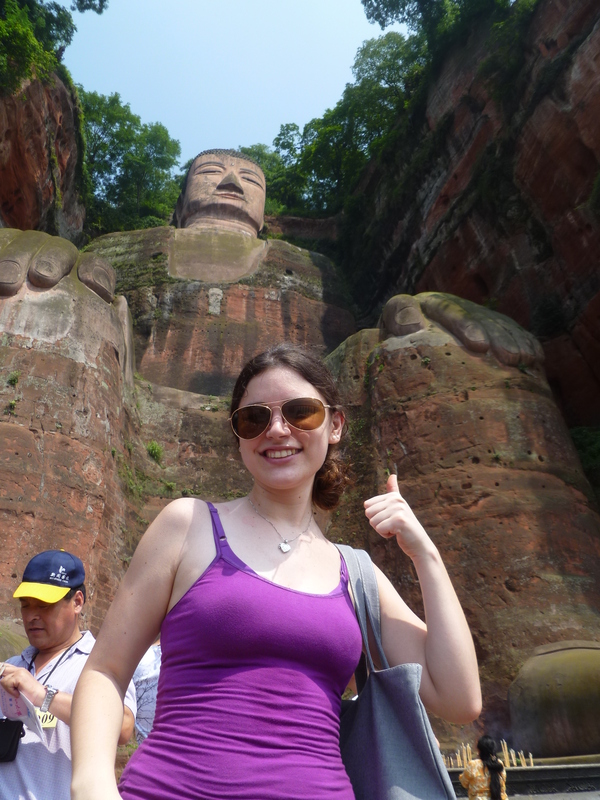 I am happy that the Leshan Giant Buddha is as large as advertised. We may have gotten bored waiting in line. 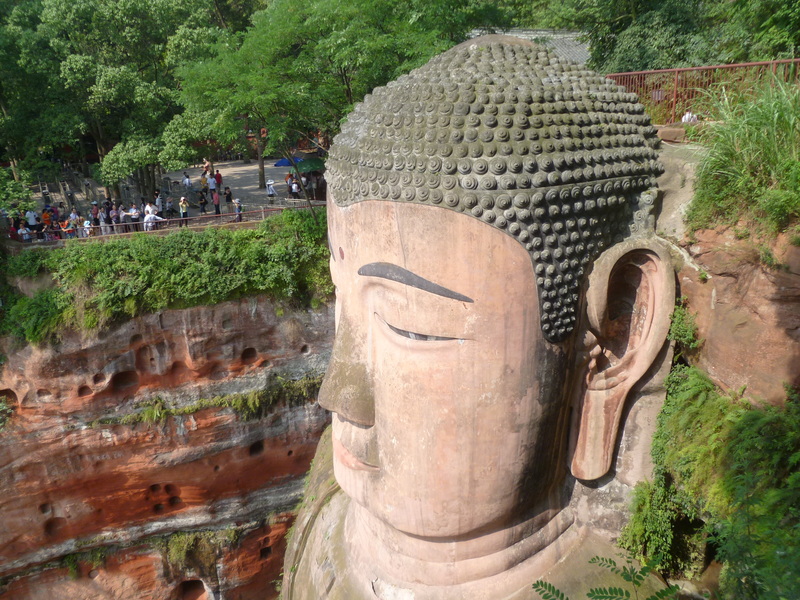 The Giant Buddha was carved in the 700s by some Buddhist monks, who were trying to calm the river below and keep ships from wrecking on the rocks and currents. 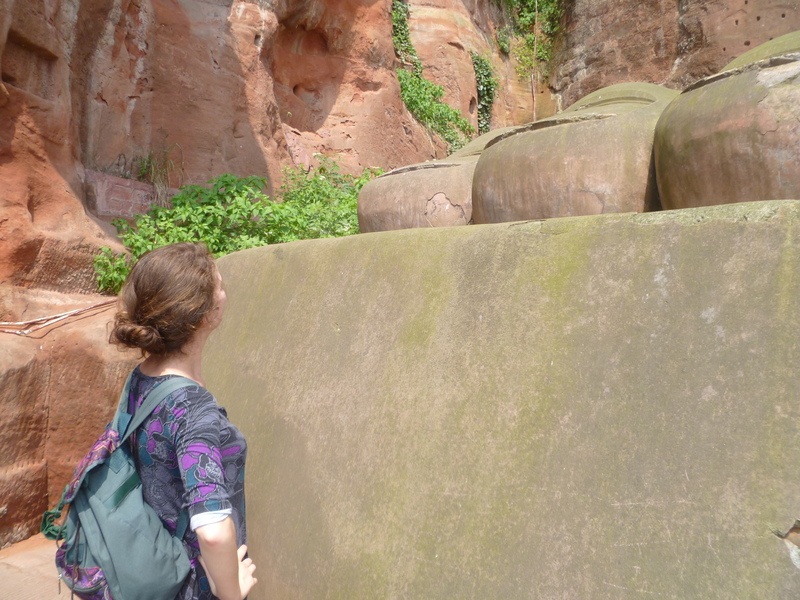 Given what I saw of the river next to the Buddha, they didn’t really succeed on that front, but they did manage to carve out a pretty darn big statue. At 71 meters tall, the Giant Buddha was and still is the largest statue in the world. The rather precarious stairway down. 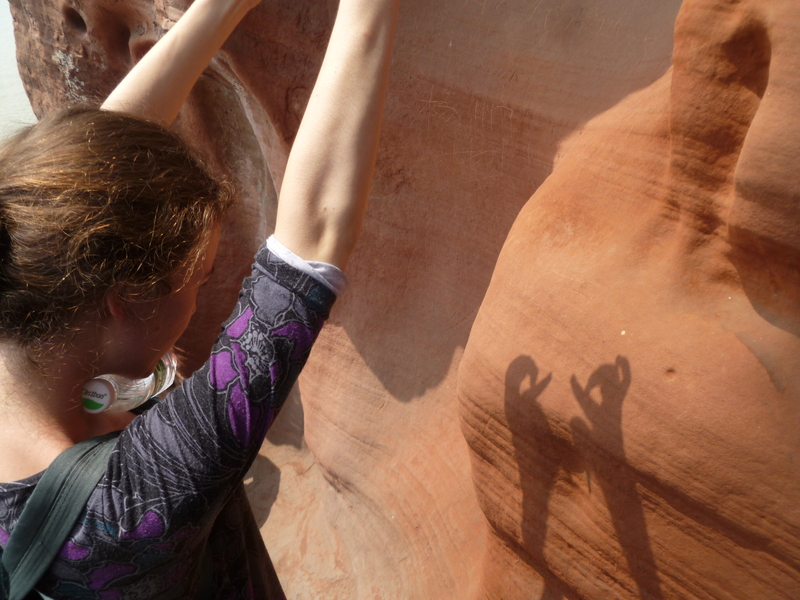 There are also smaller bodhisattvas carved into the surrounding rocks. I guess they got bored carving the big one? It was really a lot of fun and theoretically good for our karma? Whatever, like we needed an excuse to leave Chengdu. If you want to go: round trip tickets are 96 kuai. There’s a bus to Leshan every hour that drops you off in front of the Leshan bus terminal. Lots of guys will try to sell you a ride to the Dafo; don’t bother with them. The no. 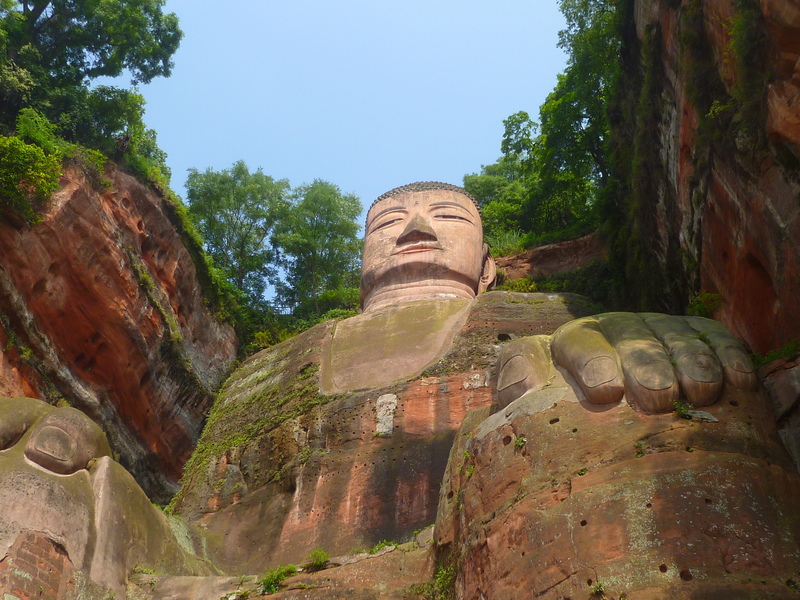 13 bus leaves from directly in front of the terminal and takes you through Leshan to the Buddha for 1 kuai. It’s a nice way of seeing the town, too. I’d recommend getting off somewhere along the route and grabbing food; as always, prices on the inside of the park are pretty damn high. Tickets to the park itself are 50 kuai for a student, 90 kuai for adults, so bring a student ID if you’ve got it! There’s a fair amount of queuing involved, so go to the bathroom before you get in line to climb down the stairs. It’s all pretty much paved stairs, so hiking boots aren’t necessary for this trip.